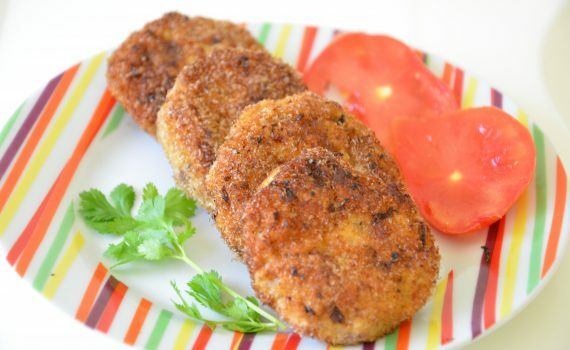 Here’s a High Protein, Low-carb recipe of Chicken cutlets with no potatoes. To make it crispy and still keep it low-carb, I have used Psyllium husk to coat the cutlets before frying. Now psyllium husk is a commonly known as Isabgol in India. It has been used for ages to treat constipation. It is now becoming popular as a low carb addition to foods. Mix all the ingredients together well and keep it in the fridge for 1/2-1hr. Heat a little oil in a pan, make a ball of the mixture, then flatten it into a patti shape. Roll it in the psyllium husk and place in the pan one by one. Turn them over and let them cook till the outside becomes golden brown in colour. Take them out and serve hot with coriander chutney. These can also be frozen after frying and can be used later as such or as a filling inside wraps/ sandwiches/burgers.